Wan Hao Chinese Restaurant (萬豪軒) at Singapore Marriott Tang Plaza Hotel has launched new handcrafted Cantonese Dim Sum masterpieces in April. Diners can look forward to indulge in an exquisite selection of steamed and fried Dim Sum using the finest and premium ingredients that will delight your palate! Steamed Prawn & Black Truffle Dumpling in Squid Ink Skin (黑松露墨鱼汁鲜虾饺) (L), Steamed Red Date Cake with Osmanthus Syrup (红枣桂花糕) (M) and Steamed Quail Egg Pork Siew Mai (鹌鹑蛋 烧卖) (R). Steamed Prawn & Black Truffle Dumpling in Squid Ink Skin (黑松露墨鱼汁鲜虾饺) available at $10++ per 2 pieces. This stunning, shiny jet-black dumpling is the lavish version of Har Gao with a distinct taste of truffle. Another fine masterpiece is Steamed Quail Egg Pork Siew Mai (鹌鹑蛋 烧卖) at $8++ per 2 pieces where you can find a boiled quail egg that has been covered with juicy pork filling. This is like the fancier version of Siew Mai that is so tasty and unique with quail egg. Steamed Red Date Cake with Osmanthus Syrup (红枣桂花糕) at $6++ per 2 pieces, Chef mentioned that he did not use any sugar, he uses only red dates which is a natural sweetener to create a natural and healthy dessert that is full of benefits. Red dates are very nutritious and good for health. Steamed Chilli Crab Bun (辣子蟹包) ($8++ per 2 pieces) (L) and Steamed Prawn with Eggplant & Black Bean Sauce (鼓汁茄茸鲜虾腐皮卷) ($8++ per 2 pieces) (R). Chilli Crab is a popular delicacy in Singapore and the Steamed Chilli Crab Bun is a must order, must try at Wan Hao. The bun has been steamed to perfection with the inside of the bun being soft and filled with succulent chunks of sweet and savoury fresh chilli crab meat while the outside of the bun remains crispy. It is such a delight to bite into this heavenly bun! Steamed Prawn with Eggplant & Black Bean Sauce is a delicious dim sum using the right combination of fresh, sweet shrimp and fatty pork that is further enhanced with the flavourful black bean sauce with the crispy beancurd skin that gives an added texture. We are a fan of soups and always enjoy a good bowl of nourishing soup. This Braised Marble Goby in Superior Stock comes with thick slices of Marble Goby, commonly known as Soon Hock that is very fresh, full of flavour from the milky-smooth, superior soup that has been broiled for hours using premium ingredients. What a gigantic dumpling! This must be one of the largest dumping that we have seen. 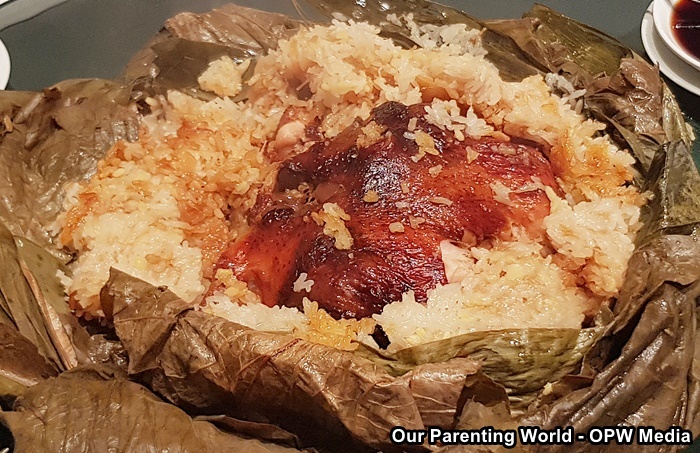 This coming Dragon Boat Festival on 7 June, Wan Hao is serving a new creation that is not the usual regular dumpling. 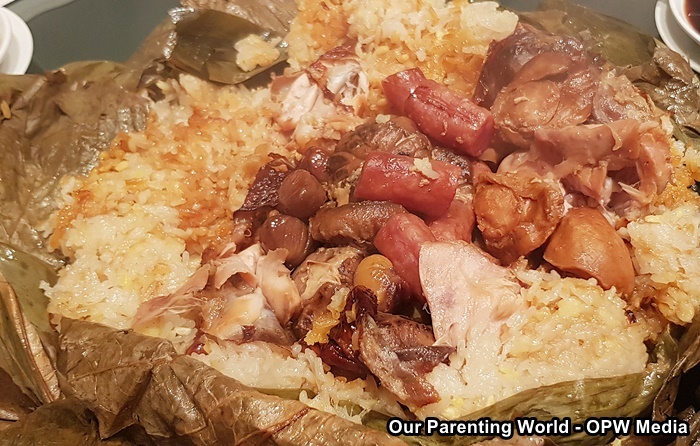 This enormous dumping is filled with 10-Head abalones, Chinese sausages, conpoy also known as dried scallop, chestnuts and shiitake mushroom stuffed in the whole chicken. This is good for 10 persons to share. Chef mentioned to us during the media tasting that he would like to encourage family to sit down to have a meal together and this dumpling will be a great centrepiece for the whole family to enjoy! This will be available from 21 May to 7 June for dine-in and take away. Don’t miss the opportunity to indulge in this luxurious and sumptuous dumpling! Bird’s Nest Tart (官燕蛋挞) at $12++ per piece is freshly baked from the oven and it is a joy to bite into this delightful warm tart that is topped with lots of Bird’s nest. 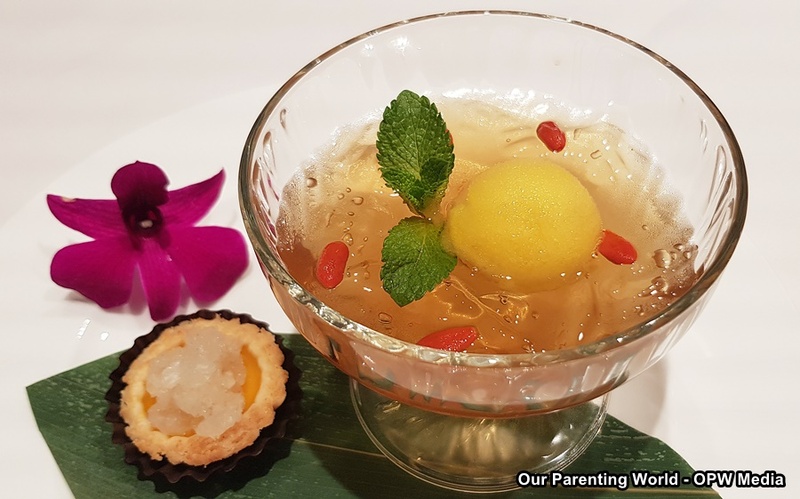 Chilled Chrysanthemum Tea Jelly with Mango Sorbet (香芒雪花伴菊花冻) at $16++ per order, this is a refreshing dessert that is made with real and natural ingredients like real chrysanthemum and mangoes.